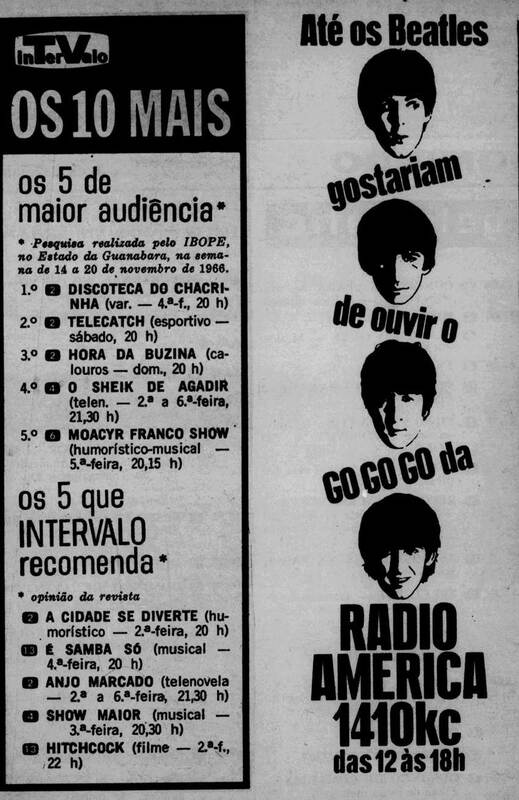 By 1966, Radio in São Paulo was very wide-ranging (ecletic). 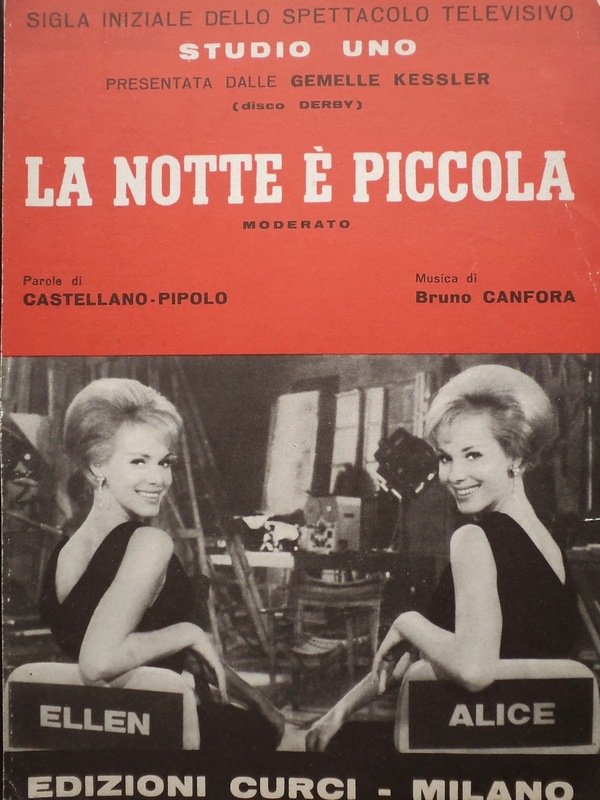 Due to the 1963-1964 'invasion' of Italian pop music plus the advancent of Brazilian pop music (later called by its acronym MPB) and Brazilian rock which went by the quaint name of 'ié-ié-ié' Radio shows were more and more varied. TV Tupi, Channel 4, started beaming on Wednesday nights, a compound of 'Studio Uno', an Italian top variety show compered by German Kessler Twins and the great Mina. TV Tupi also showed American TV 'Shindig' on Saturday evenings. By the way, the Journalist Union entered a plea with the Brazilian government to ban these foreign musical shows due to their unfair competion with the local product. By the end of 1966, all foreign musical TV shows were properly banned. German Twins Ellen & Alice Kessler were the darlings of Italian TV and could be seen on TV Tupi every Wednesday night until such programmes were banned by the Government. 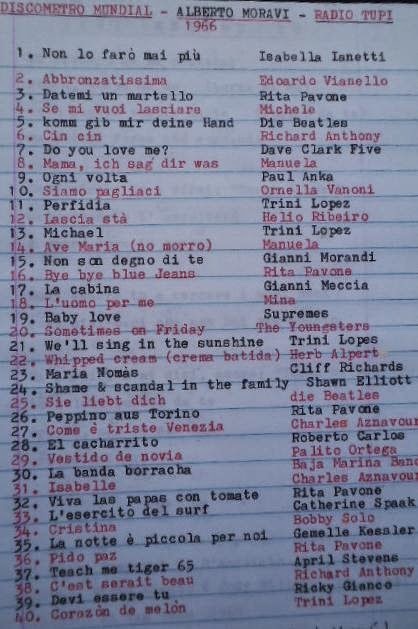 Here's a list of the most played hits on Alberto Moravi's 'Discômetro Mundial' on Radio Tupi, the most popular radio station then. As Moravi hardly spoke Portuguese, his programme ended up being banned for the same reasons the TV shows were lifted from the air: unfair competition with the local productions. In Moravi's case the production was done in São Paulo, but they claimed he was a 'foreigner taking away Brazilian jobs'. 'Discômetro Mundial' was such a fantastic radio show from 9:00 to 10:00 AM. DJ Alberto Moravi played his private 45 rpm collection he had been sent from Europe and USA. He would play Rita Pavone singing in German (Peppino aus Torino), Roberto Carlos in Spanish (Mi cacharrito), Cliff Richards in Spanish (Maria Nomás), The Beatles in German (Kom gib mir deine Hand) and the latest hits by Trini Lopez, Richard Anthony etc. that were not released in the country yet. Radio America belonged to Radio Bandeirantes and as the management realized the growth of the youth oriented market they launched a new programming based on the Top-40 US radio stations aimed at that youth market: young DJs João Paulo de Andrade, Ferreira Martins and Jorge Helau filled the 12:00 noon to 6:00 PM slot. 'Intervalo' November 1966.